At Vicia in St.Louis,Best New Chef Michael Gallina closes the loop in his cooking.This elegant amuse-bouche showcases Gallina's zero-waste approach: Tomato skins are dried to become an umami-rich flavored salt;the tomato seeds and pulp,plus the brine of pickled green tomatoes,become the base of the Tomato Water Gazpacho. Bring a large pot of water to a boil over high.Prepare an ice bath in a large bowl. Using a paring knife,core beefsteak tomatoes.Score an "X" on bottom of each tomato.Carefully drop into boiling water,and cook until skins begin to pull away,about 2 minutes.Remove tomatoes with a slotted spoon,and immediately drop into ice bath to stop the cooking process. Drain tomatoes,and peel off skins.Reserve tomato skins for Tomato-Skin Salt. Quarter peeled tomatoes;scoop out seeds and liquid,reserving 1 cup seeds and liquid for Tomato Water Gazpacho (recipe follows).Discard remaining seeds and liquid.Set tomato quarters aside. Add tomato quarters and remaining 1/2 teaspoon sea salt.Reduce heat to low,and cook until all moisture has cooked away and tomatoes begin to fry,about 20 minutes. Remove from heat,and let cool slightly,about 10 minutes.Transfer to a food processor,and process until smooth.Season to taste with sea salt,and transfer to an airtight container.Mixture may be stored in refrigerator up to 5 days. Place green tomato slices in a sealable container.Pour warm brine over tomatoes,and let cool,uncovered.Pickled tomatoes may be used after 30 minutes or covered and stored in refrigerator up to 5 days. Preheat oven to lowest possible temperature.Arrange reserved tomato skins from tomato sofrito on paper towels,and blot dry.Spread tomato skins in an even layer on a parchment paper–lined baking sheet.Bake in preheated oven until dry and brittle,8 hours or overnight. Transfer dried skins and sea salt to a food processor,and pulse until combined.Store in an airtight container at room temperature. 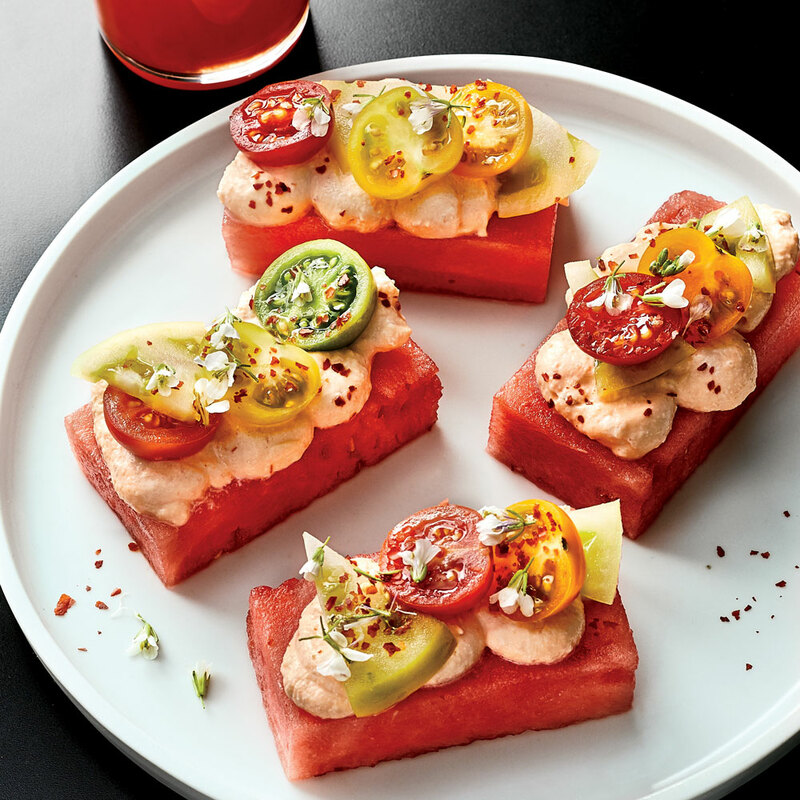 Cut rind from watermelon;discard rind.Cut watermelon into 15 (3- x 1 1/2- x 3/4-inch) planks;reserve 2 cups scraps for Tomato Water Gazpacho.Set planks aside. Combine 1 cup tomato sofrito and goat cheese in a food processor.Pulse until smooth;season to taste with sea salt.Transfer mixture to a ziplock plastic freezer bag;snip 1 corner of bag to make a small hole. Pipe about 2 teaspoons sofrito-cheese mixture over each watermelon plank,spreading evenly into a thick layer.Top each with 2 pickled green tomato slices,and season with tomato-skin salt.Reserve 1/2 cup liquid from pickled green tomatoes for Tomato Water Gazpacho.Sprinkle watermelon planks evenly with sliced herbs.